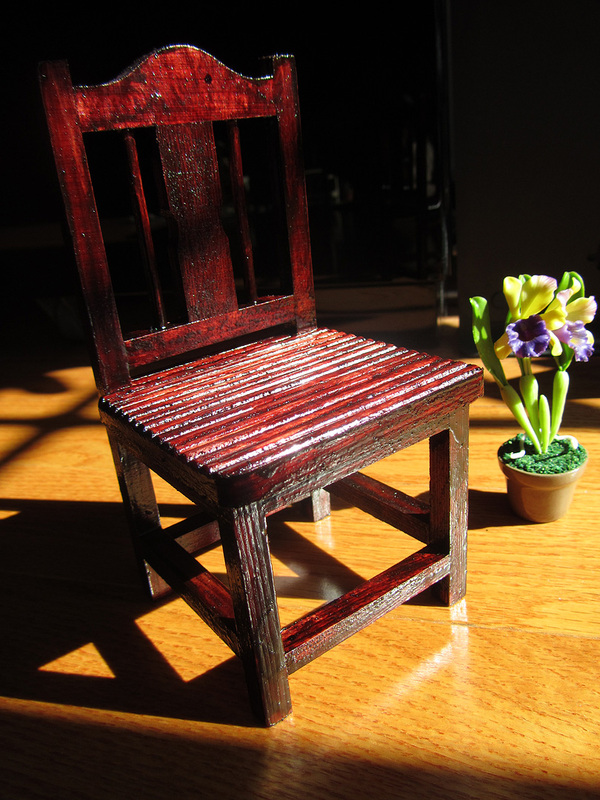 A few weeks back, I was browsing through the crafts section of a local Dollarama when I spotted these wooden chairs. They seemed to be to scale with my fashion dolls so I was instantly inspired to paint. 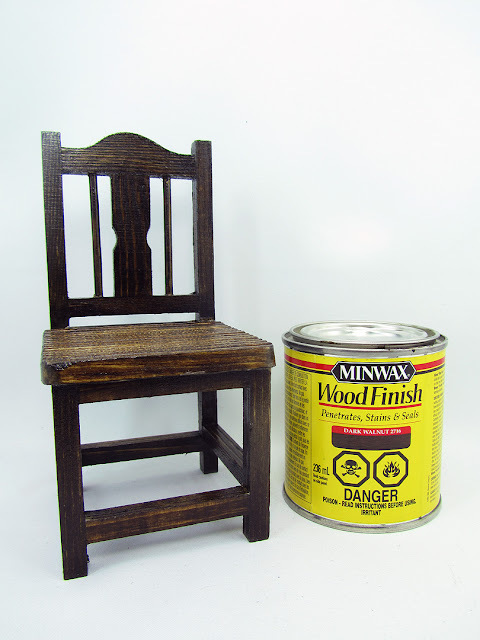 I had purchased cans of wood stain for projects that had yet to transpire and the wooden chairs were a perfect reminder that I hadn't done anything crafty lately. One of the wood finishes that I had was in dark walnut. I had to gloss it separately, while the one I had in mahogany was a 2 in 1 deal, where it automatically dried glossy. I found it easier to work with the dark walnut stain. I just felt like I was in better control of the staining process. The mahogany one was thicker because the sealant was mixed with the stain so the wood didn't absorb it as well as I had wanted it to. It was much faster, however, as I skipped one drying step. Overall, I prefer the mahogany chair. It was just a richer color. 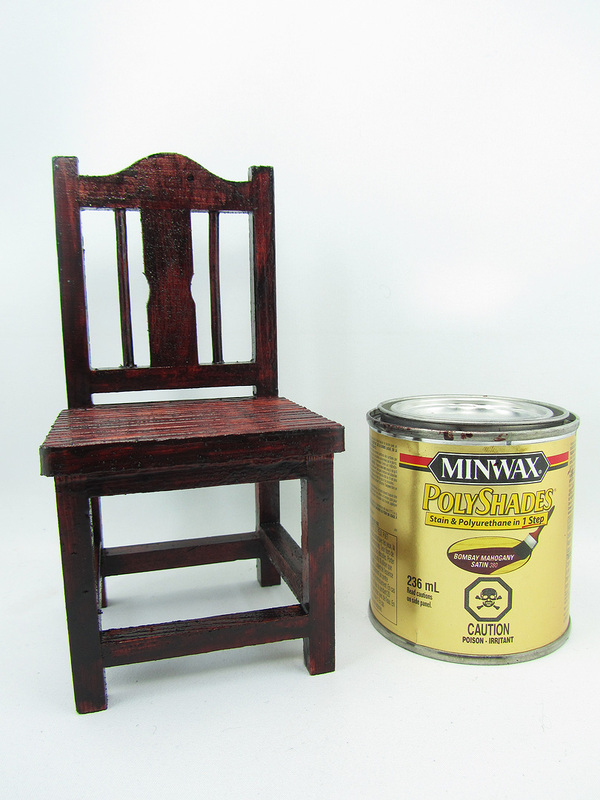 And even though, I made many booboos with it, using the wrong brush and over staining, etc. I think the end result looks kinda cool. Very rustic. Oh, very nice! I like both finishes, but the mahogany one does look richer. They both look very nice - in fact, I couldn't say which was my favourite. Thank you. I have a few more of these chairs and I'm wondering whether I should continue with the rustic look or the neater walnut. Thank you Marta. Always a pleasure to see you here! Nice find! Both turned out really nice. Staining can be such a pain. Thanks. Staining can definitely be a pain. The messiness is the source of it all for me...Oh and the waiting time too! Really nice chairs! I love dioramas! Loved Aria's tights and shoes! Thanks. It's actually Poppy Parker, although she is looking very Aria-ish because of their similar toasty skin tone.